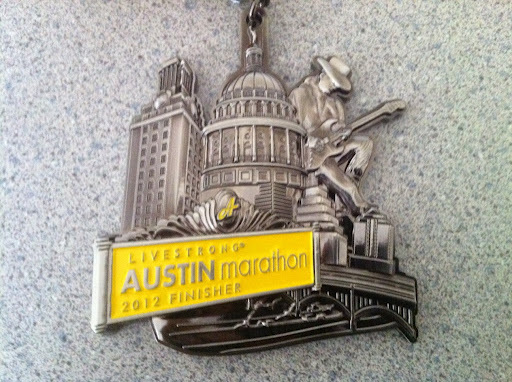 This morning, Austin hosted its marathon and a half-marathon. A few weeks ago, at the request of a friend, I signed up to run the marathon. That friend had indicated she wanted to run the first half “easy” and that I should run it with her. I agreed and then a week later learned that her idea of “easy” is lightning fast for me. Knowing I was untrained for a full and would likely be running solo even for much of the first half, I geared up in my own head to run the half marathon instead of the full marathon. I almost didn’t run at all, but I had paid, so I set out to get something for my money. This morning, my lightning fast friend and I started together, and sure enough I lost her before we hit the third mile marker. So I ran my own race and was feeling pretty good. I was fairly ready for the half given my consistent 5 and 7 mile runs in recent weeks and the confidence-building 10 miler I ran last weekend. But then I ran into trouble in my head. As I approached the point between miles 10 and 11 where marathoners went left and half-marathoners went right, I struggled with the knowledge that my race bib indicated I was running the full. If I ran the half, I would not “finish” my race. I would finish the half, but the half was not my race. I would be doing less than I signed up to do, and I would be choosing the easy way out. Though I know that running a half marathon is a wonderful accomplishment, it would not have been so for me today. I would not have been proud of myself. I would have felt like a quitter, and I didn’t want to be a quitter, at least not without permission. I solved the dilemma as I often do – through a game of chance. I decided that I would run the full unless I saw my friend who has been coaching me lately. She lives near the point where the full splits from the half, so I decided that if she was out there cheering, I could ask her for assurance that doing the half was not a terrible idea, given this stage in my training, and wouldn’t make me a failure on any level. She would have given me that assurance, I’m sure. But she wasn’t out there. So left I went to face the next 15 miles. I’ve always been a little leftward-leaning anyway. What a testament this is to your resolve and your willingness to trust yourself to do the full. Inspiring dear lady, inspiring!! Wow, what a neat story! Congrats on the unplanned accomplishment!